Due to Brian’s embarrassing flea problem, the Griffin’s move into a hotel while the house if fumigated. Lois and Peter soon discover that Chris has been skipping gym class because he’s self-conscious about his body. 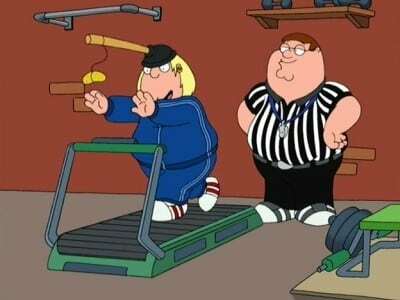 Peter tries to talk Chris into getting liposuction, while Lois starts preparing him special low fat meals. Stewie starts taunting Chris by eating everything in sight, and starts packing on the baby fat. Even though Chris isn’t up for surgery, Peter decides to go for it. The new, svelte Peter has Lois all hot and bothered. Peter loves the results of his lipo and decides to have some work done on his face. The new, handsome Peter starts getting all sorts of special treatment: at the gym, at the grocery store, even from total strangers. 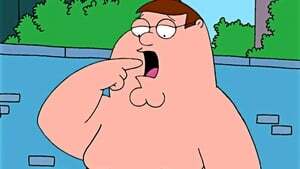 Lois doesn’t like the new Peter’s attitude, especially when he joins “The Beautiful People’s Club.” Karma catches up to Peter while he’s on his way to the club. Unable to take his eyes off himself, Peter plunges his car over a cliff. The nasty fall – and subsequent crash-landing into a large vat of lard – leaves him horribly disfigured (ie: back to normal).